WASHINGTON, D.C. -- As Secretary of State John Kerry traveled to Kiev, Ukraine, this week to show solidarity with the interim Ukrainian government, a recent Gallup poll finds that a majority of Americans have a generally favorable view of the secretary. Fifty-five percent in the U.S. view Kerry favorably, up seven percentage points since last September. These results come from Gallup's annual World Affairs poll, conducted in February. The survey preceded the current crisis in Ukraine but followed the deal the U.S. and other countries reached with Iran to temporarily freeze parts of its nuclear program in exchange for the relaxation of some Western sanctions. Gallup last asked Americans about Kerry in September 2013, when he was in the midst of U.S. debate over military action in Syria. At that time, Kerry said Syria's use of chemical weapons on its own people was "undeniable" and announced that the U.S. was pondering intervention in the conflict. At that time, 48% of Americans viewed Kerry favorably, while 35% viewed him unfavorably. In April 2013, two months into his tenure as secretary of state, 44% of Americans regarded Kerry favorably. So in less than a year, as more and more Americans have felt they knew enough about Kerry to rate him, his favorable ratings have risen 11 percentage points, while his unfavorable ratings have stayed essentially constant. Gallup has asked about Kerry's favorability periodically since 1999, covering his time as senator from Massachusetts and Democratic presidential nominee in 2004. His current 55% favorable rating ranks on the high end of those ratings, with his personal best of 61% coming after his victories in the 2004 Iowa caucuses and New Hampshire primary that made him the clear front-runner for the 2004 Democratic nomination. At the time of the general election that year, 52% viewed him favorably and 43% unfavorably. While Kerry is enjoying the popular approval of a majority of Americans one year into his tenure, his favorable rating is lower than ratings of four of the last five secretaries of state at comparable points in office. Kerry's immediate predecessor, Hillary Clinton, had a 61% favorable rating after approximately one year in office. More than 60% of Americans also favored Condoleezza Rice and Madeleine Albright a year into their terms. Colin Powell enjoyed a high 85% favorability rating roughly one year into his service as secretary of state. That measure, taken in April 2002, at least partly reflected Americans' rallying for the government after 9/11, resulting in high approval ratings for the Bush administration and Congress. Kerry's favorability ratings after his first year in office eclipsed only those of President Bill Clinton's first secretary of state, Warren Christopher. The late secretary, who served in Clinton's Cabinet from 1993-1997, had a favorable rating of 41% after roughly his first year in office, with 21% of Americans viewing him unfavorably and 39% either not having heard of or having no opinion of Christopher. Much of the world is focused on Kerry this week as the U.S. and Russia engage in brinkmanship over Russia's military involvement in Ukraine. In his year in office, Kerry has been involved not only in the Ukrainian crisis but also the chemical weapons situation in Syria, developing a framework for peace talks between Israel and the Palestinians, and nuclear peace talks with Iran. Although the question wording identified Kerry as secretary of state, Americans may also remember him as a longtime senator from Massachusetts or as the failed presidential candidate from 2004. 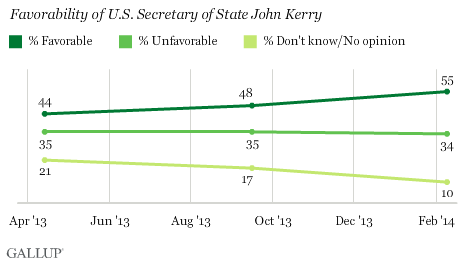 Still, as this series of world conflicts persist, Kerry's favorable ratings as secretary of state are rising. The secretary will be faced with a variety of challenges this spring. Kerry was supposed to be focused this month on achieving progress on Mideast peace, possibly reaching a historic agreement on the framework for peace talks, and now he is mired in a Cold War-like geopolitical conflict he likely never envisioned when he became secretary. Results for this Gallup poll are based on telephone interviews conducted Feb. 6-9, 2014, on the Gallup Daily tracking survey, with a random sample of 1,023 adults, aged 18 and older, living in all 50 U.S. states and the District of Columbia. Terrorism, Iranian Nukes Considered Greatest Threats to U.S.
Americans consider international terrorism and Iranian nuclear weapons the top threats to the U.S. in the next 10 years, although mentions of terrorism are down slightly from past years. Americans are as doubtful as ever that Israel and the Arab nations will ever settle their differences peacefully. A third now expect this, down from 38% in 2012. Sympathy for Israel in the Palestinian-Israeli dispute remains high. Americans evaluate Secretary of State John Kerry's job performance positively, with 60% approving. Vice President Joe Biden also gets majority approval, at 51%. Both have higher job approval ratings than President Barack Obama.